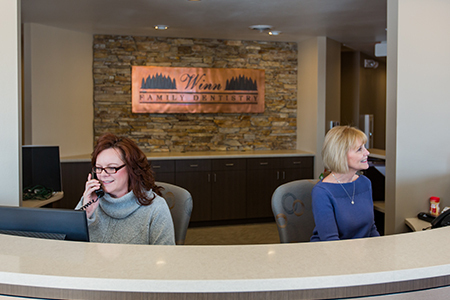 Thank you for choosing Winn Family Dentistry as your dental care provider. We are committed to your dental health. Please understand that payment of your bill is considered a part of your treatment. The following is a statement of our Financial Agreement, which we require you to read and sign prior to treatment. CareCredit–CareCredit is available to help you pay for treatments and procedures your insurance doesn’t cover. CareCredit offers deferred interest financing or low minimum monthly payment options. Visit www.carecredit.com for more information and to apply. If you carry dental insurance, we are happy to file the claim for you and estimate your co-payment. (You will be responsible for the non-covered portion at the time of service.) We can make no guarantee of any estimated coverage or payment from your insurance carrier. Our relationship is with you and NOT your insurance carrier. The type of plan chosen by you and/or your employer determines your insurance benefits. Please let us know if you have any questions about your insurance coverage.